BLDC motors offer several advantages over brushed DC motors, such as higher torque & efficiency, longer life, increased reliability, much lower electromagnetic interference (EMI) and require very little or no maintenance. 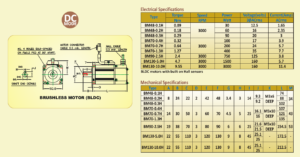 Click here for JEDL BLDC Motors Data Sheet. Jayashree works with OEMs to meet their electrical and mechanical design requirement specifications. Brushless motors are ideal for use in printing machines, textile machines, coding machines, conveyors, packaging machines, sewing machines, jewellery machines, actuators, door operators, machine tools, etc. in adjustable or variable speed applications. They can develop high torque with good speed response. In addition, they can be easily automated for remote control. Jayashree BLDC motors deliver great performance due to their characteristics of high peak torque, high continuous torque and high rated speed— with a low cogging torque. High continuous torque requires a motor that can manage heat. Tightly filled stator windings are designed to avoid build up of hot spots in the motor. The thermal design ensures even and easy heat dissipation. The Class H (180ºC-rated) winding insulation protects the motor during long operating cycles, and there is no significant deterioration of the magnetic properties of its sintered rare earth magnets. Jayashree BLDC motors show a flat torque curve over a wide range of speeds. Many BLDC motors have the problem of a high cogging or detent torque (Detent torque is the amount of torque that must be applied to a motor to overcome the static (magnetic) equilibrium of the motor when it is in an unpowered state of rest). They also often have significant distortion in their back-EMF signature which leads to high torque ripple. Jayashree BLDC motors are designed for smooth operation with a low cogging / detent torque and a linear, low-ripple torque output.